1. City in Egypt, mentioned in Isa. xix. 18: "In that day there shall be five cities in the land of Egypt that speak the language of Canaan, and swear to the Lord of hosts; one shall be called 'Ir ha-Heres" (A. V. "the city of destruction"; R. V. margin, "Heres"). 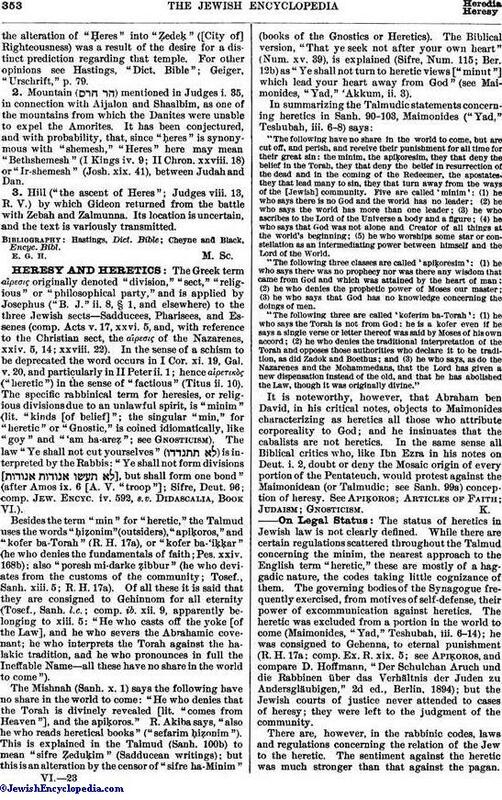 The Masoretic text, Aquila, Theodotion, and Peshiṭta read "City of Destruction." Symmachus, the Vulgate, Men. 110a, Saadia, and some Hebrew manuscripts read ("City of the Sun"). The Septuagint has πολις ἀσεδέκ ("City of Righteousness"). There are many differences of opinion regarding the proper reading of this name. 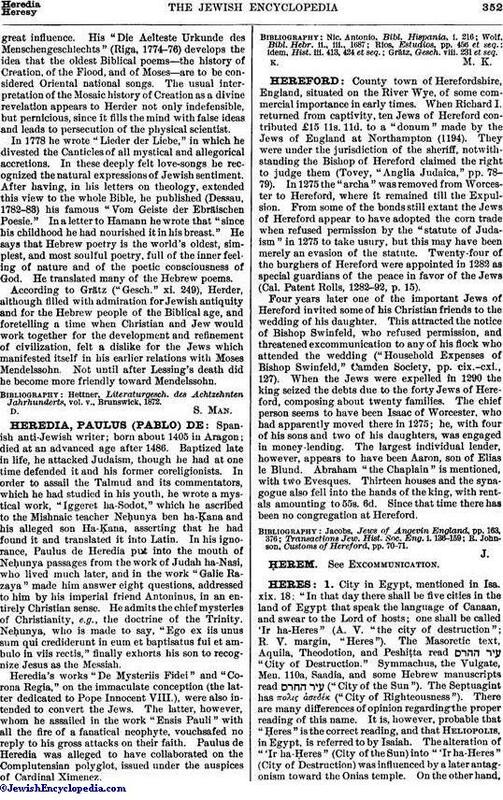 It is, however, probable that "Ḥeres" is the correct reading, and that Heliopolis, in Egypt, is referred to by Isaiah. The alteration of "'Ir ha-Ḥeres" (City of the Sun) into "'Ir ha-Heres" (City of Destruction) was influenced by a later antagonism toward the Onias temple. On the other hand,the alteration of "Ḥeres" into "Ẓedeḳ" ([City of] Righteousness) was a result of the desire for a distinct prediction regarding that temple. For other opinions see Hastings, "Dict. Bible"; Geiger, "Urschrift," p. 79. 2. Mountain ( ) mentioned in Judges i. 35, in connection with Aijalon and Shaalbim, as one of the mountains from which the Danites were unable to expel the Amorites. It has been conjectured, and with probability, that, since "ḥeres" is synonymous with "shemesh," "Heres" here may mean "Bethshemesh" (I Kings iv. 9; II Chron. xxviii. 18) or "Ir-shemesh" (Josh. xix. 41), between Judah and Dan.